Since 2012 a crawler crane from Liebherr-Werk Nenzing’s LR series has operated under harsh environmental conditions in Russia’s far north. The LR 1280 belongs to the customer Almazy Anabara and currently operates in Jurjung-Chaja in the north of the autonomous Russian Republic Yakutia. 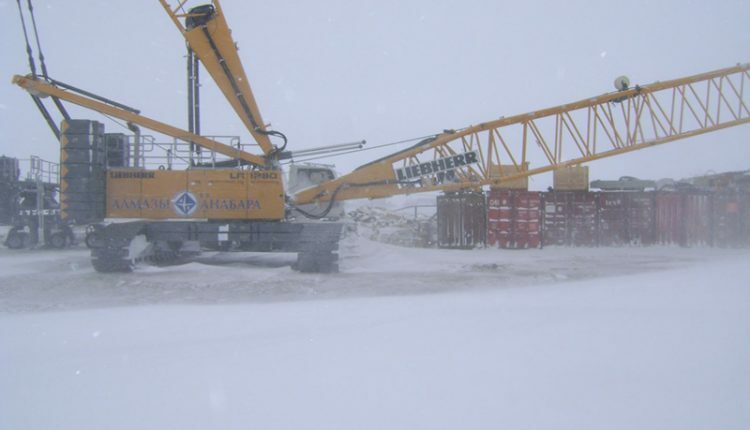 Temperatures in summer can go up to almost 86⁰ F. In winter, however, they can drop to as low as -76⁰ F. In order to cope with this extreme cold during winter months, the crane is equipped with the Liebherr arctic package. The LR 1280 is driven by a 450 kW (603 hp) 8-cylinder Liebherr diesel engine. It is fitted with derrick and ballast trailer for higher load capacities. The LR 1280 is used during summer months for the loading and unloading of ships. In winter, the river Anabar is frozen – the cargo then has to be loaded onto trucks for being transported on the so-called winter road. The machine computes lifting capacities automatically during crane operation, making it the only current device on the market that does not need memorized load charts or interpolated intermediate values. All Liebherr crawler cranes are equipped as standard with the proven Litronic system, which incorporates all control and monitoring functions, ensures high safety through redundant safety systems and works at extreme temperatures, under humid conditions and vibration.